PHILADELPHIA -- The Philadelphia Eagles have agreed to a one-year deal with former New England Patriots running back LeGarrette Blount, the team announced Wednesday. A source told ESPN's Josina Anderson that the deal is worth up to $2.8 million, with a base value of $1.25 million and incentives worth upward of $1.55 million. "LeGarrette Blount is a tough, physical runner who has enjoyed a great deal of success in New England and we are excited about adding him to this football team," Eagles executive vice president of football operations Howie Roseman said in a statement. "We feel good about the depth and competition that we have created at the running back position and we are looking forward to getting the guys out on the field next week for OTAs." The Patriots had issued an unrestricted free-agent tenderpotentially worth $2.1 millionto Blount last week before the May 9 deadline that ensured the running back will count toward the 2018 compensatory pick formula. Blount was the only player in the NFL to receive the UFA tender this year. A source told ESPN last week that clubs expressing interest in signing Blount had been vetting a deal structure that can navigate the compensatory pick calculation. It is unclear whether the Eagles structured Blount's deal in such a way as to avoid it counting toward the 2018 compensatory pick formula. Blount entered free agency after the most productive season of his seven-year career. He led the NFL with 18 rushing touchdowns, which was the highest total in the NFL since Adrian Peterson had 18 in 2009. He was the Patriots' top power running back, totaling 1,161 yards on 299 carries in the regular season. New Eagles receiver Alshon Jeffery wasted little time welcoming Blount to the team. 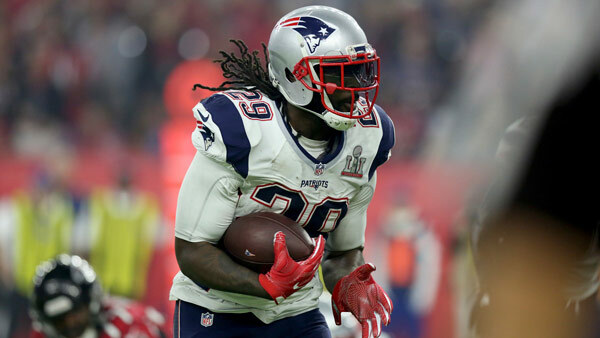 The Arizona Cardinals also had showed some interest in acquiring Blount, a source told ESPN NFL Insider Adam Schefter. Blount, who turned 30 in December, has had the most success in his career with the Patriots, with whom he's had two separate stints. The Patriots acquired him in a trade with Tampa Bay in 2013, and Blount signed a one-year deal with the Steelers the next year, before returning to New England later in the 2014 season after Pittsburgh released him. According to the Elias Sports Bureau, the only other player since 1933 to change teams after a season in which he was the NFL's outright leader in rushing touchdowns was Greg Bell, who went from the Rams to the Raiders in 1990. In 100 regular-season games, Blount has rushed for 5,122 yards and 49 touchdowns.